Calypso is a style of Afro-Caribbean music which originated in Trinidad at about the start of the twentieth century and branched into separate categories such as soca music (soul calypso) and extempo (lyric improvised calypso). The roots of the genre lay in the arrival of African slaves, who, not being allowed to speak with each other, communicated through song. This forged a sense of community among the Africans, who saw their colonial masters change rapidly, bringing French, Spanish and British music styles to the island of Trinidad. The French brought Carnival to Trinidad, and calypso competitions at Carnival grew in popularity, especially after the abolition of slavery in 1834. While most authorities stress the African roots of calypso, in his 1986 book Calypso from France to Trinidad, 800 Years of History veteran calypsonian The Roaring Lion (Rafael de Leon) asserted that calypso descends from the music of the medieval French troubadours. Over 100 years ago, calypso further evolved into a way of spreading news around Trinidad. Politicians, journalists, and public figures often debated the content of each song, and many islanders considered these songs the most reliable news source. Calypsonians pushed the boundaries of free speech as their lyrics spread news of any topic relevant to island life, including speaking out against political corruption. Eventually British rule enforced censorship and police began to scan these songs for damaging content. Even with this censorship, calypsos continued to push boundaries. The first calypso recordings came in 1914, and inaugurated the Golden Age of Calypso. By the 1920s, calypso tents were set up at Carnival for calypsonians to practice before competitions; these have now become showcases for new music. The first major stars of calypso started crossing over to new audiences worldwide in the late 1930s. Attila the Hun, Roaring Lion and Lord Invader were first, followed by Lord Kitchener, one of the longest-lasting calypso stars in history—he continued to release hit records until his death in 2000. 1944's Rum and Coca-Cola by the Andrews Sisters, a cover of a Lord Invader song, became an American hit. 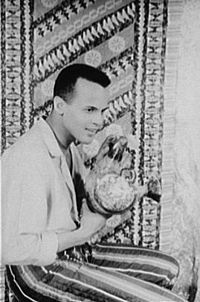 Portrait of Harry Belafonte, February 18, 1954, by photographer Carl Van Vechten. Calypso, especially a toned down, commercial variant, became a worldwide craze with the release of the "Banana Boat Song," a traditional Jamaican folk song, whose best-known rendition was done by Harry Belafonte on his 1956 album Calypso; Calypso was the first full-length record to sell more than a million copies. 1956 also saw the massive international hit Jean and Dinah by Mighty Sparrow. This song was a sly comment as a "plan of action" for the calypsonian on the easy availability of prostitutes after the closing of the United States naval base on Trinidad at Chagaramas. In the 1957 Broadway musical Jamaica Harold Arlen and Yip Harburg cleverly parodied "commercial," Harry Belafonte style Calypso. Early forms of calypso were also heavily influenced by jazz such as Sans Humanitae, the extempo melody in which calypsonians lyricise impromptu, commenting socially or insulting each other, without humanity—once again the French influence. Many calypso chord progressions can be linked to twelve bar jams in jazz as demonstrated by Lord Kitchener, one of the most famous calypsonians and a melodic genius. This page was last modified on 6 January 2017, at 22:58.